Michael Sheehan is the managing partner and clinical director of Bay State Physical Therapy in Chelmsford. 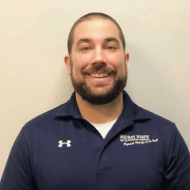 Prior to opening the Chelmsford clinic, Michael was the clinical manager of Bay State Physical Therapy in Beverly. Michael specializes in Sports Medicine and utilizes a hands on approach to treatment of injuries to the spine and extremities. He received his Bachelors of Science degree in Exercise Physiology at the University of New Hampshire and his Doctorate of Physical Therapy at the University of Massachusetts-Lowell. Michael continues to be active and enjoys playing a wide variety of sports. He uses his athletic background and a combination of manual therapy techniques along with therapeutic exercises in order to restore function and enable patients to return to the activities they love. Michael has also taken an interest in Pediatric Care since the premature birth of his son Mikey. Michael enjoys spending time with his wife, two sons and two active dogs Chara and Tuukka. Additionally, Michael is a huge Boston sports fan especially the Boston Bruins!